Hi Connie here again today to share a little country scene I made. 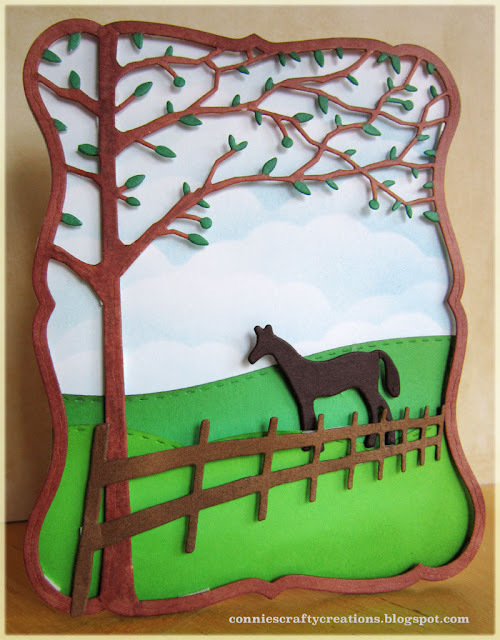 I think this scene would work for any Horse lover or person that just loves the countryside so it can be for male or female on your card making list. 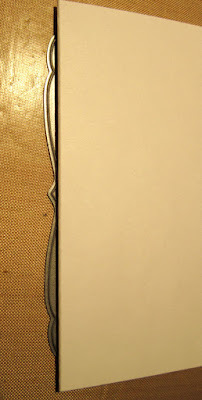 I wanted my card to be a shaped card so I did a top fold on my card, here is a picture of how I laid the fold onto my die, I used removable tape to keep it in place on the bottom while cutting. 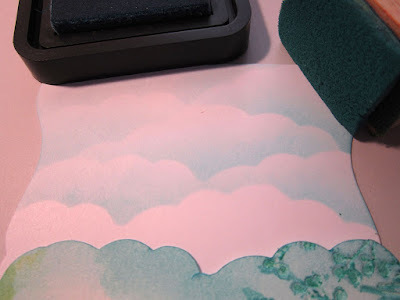 I sponged the background (card base) again like I did in my bird card, I thought I would share a picture of the background in progress, I sponge the top of my template that I made and then move the template in another area and repeat all the way down. The background looks a little pink in this picture but it is cream cardstock I was working on. 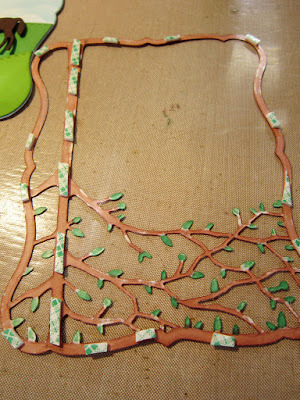 I wanted a little dimension on my scene so I added Scotch Permanent mounting tape that I cut in small pieces to add to the back of my cut out of the tree. You can see my background scene on the top left there, I had added the two different greens to show rolling hills. I ended up moving the horse down a little bit farther than what you see in that picture because it looked like he was standing on the fence. You wouldn't have to do a shape card to make this little scene you can just add it to any card base. 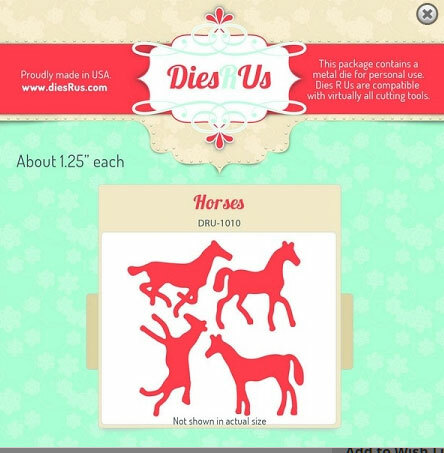 Dies R us no longer carries the Memory Box Debutante Frame or Orchard Tree Frame, I am so sorry about that, but I would like to suggest a couple others that you could also use. 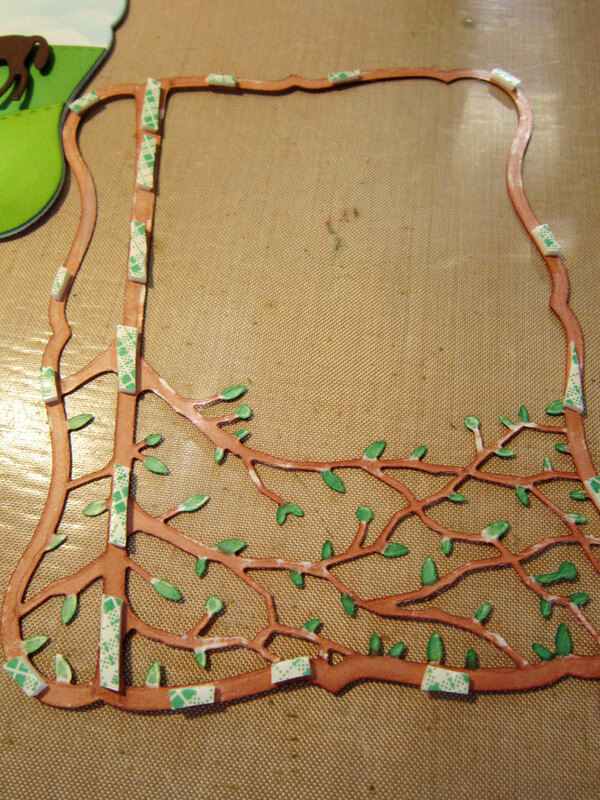 Memory Box Forest Tree Frame or the Memory Box Woodland Tree Silhouette. The following are the dies I used for this project. Thanks so much for stopping by today and join us every day for more creative projects from the design team, and check out the Challenge blog for fun challenges on the 1st and 15th of the month! I love this card Connie! 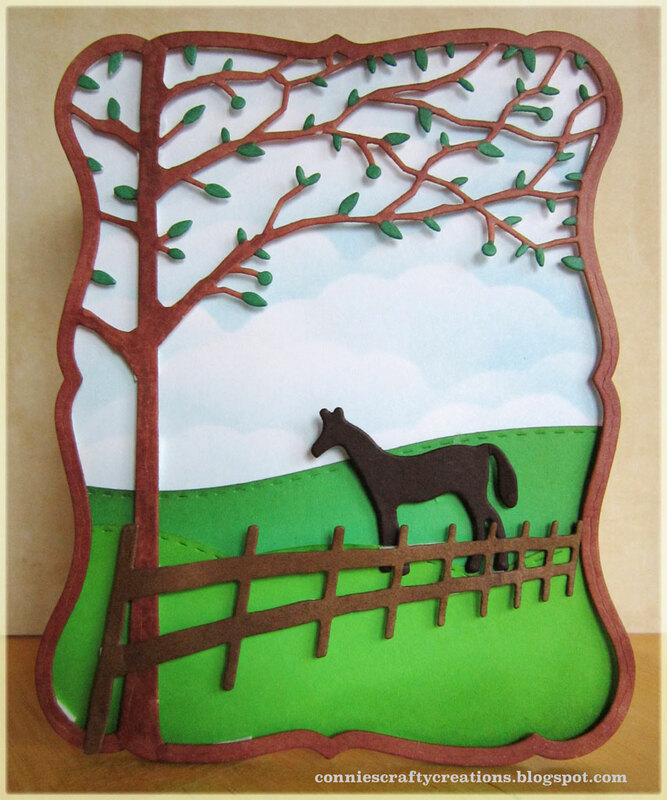 You have created a fantastic shaped card with a beautiful scene, I would never have thought of doing that Popular one for many occasions! This is such a sweet, sweet card and fabulous scene you've created. I have seen those fence dies and am happy to see them at work. Sometimes I have a hard time visualizing things. What a beautiful card!! What a beautiful country scene you have created! LOVE that beautiful tree die! Great step by step tips too. Hey, maybe your horse is well balanced and could have stood on your fence lol Fantastic card, great shape too!!! Thanks for sharing your tutorial on making the sky background. I need to try that because it looks so real. Great card with a lot of dimension. Beautiful use of this framed die cut, Connie, in creating a shaped, interesting card. Your serene countryside scene is peaceful and soft. I feel as though I've been to a class with all the fabulous technique tips and terrific photos! And you colored every tiny leaf! Whew! The two colors of grasses do look like rolling hills! Wonderful design, Connie!